Tickets were being sold in batches. The tickets were released in various batches, depending on the allocation of seats in the arena. No information on when the batches were released. Up to 70,000 tickets for Eurovision 2017 were sold for nine shows: six dress rehearsals, two semi-finals and the Grand Final. There was a maximum of 4 tickets per purchase transaction, although there was no limit to the number of transactions any one person can make. There had been reserved 900 ticket packages for members of a fan club under OGAE. The tickets were sold separately through the official fan clubs. Despite earlier announcements there will be no OGAE ticket package on sale for Eurovision 2017. 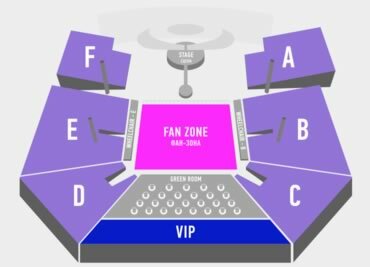 The start of tickets sale depended on two factors: Firstly selection of ticket agency, and secondly a floor plan of seats/stands in the arena, when stage design, green room and camera placement have roughly been decided. The organizer has selected the Ukrainian ticket agency Concert.ua as the official ticket partner to deal with the sale of tickets for Eurovision Song Contest 2017. Last year the ticket sale for Eurovision 2016 started on Thursday 26 November 2015 through the ticket partner axs.se. The three previous years the tickets has been released in various batches, depending on the allocation of seats in the arena. Last year there were three batches of tickets: The first batch of tickets went on sale on 26 November 2015. The second on 29 February 2016 and the third on 8 April 2016. More tickets for the Fan-Zone and Golden Circle will be released for all 9 shows on 3 May 2017 at 14:00 CEST via concert.ua. More tickets for the Fan-Zone and Golden Circle will be released for all 9 shows on 29 April 2017 via concert.ua. The next wave of tickets for Eurovision Song Contest 2017 will be on sale on 10 April 2017 on concert.ua. There will be tickets available for all shows, including the Grand Final. The second wave of tickets for the live shows of the 2017 Eurovision Song Contest are available for sale from 14:00 CET on concert.ua. Further waves of ticket sales will be confirmed in due course. Some customers have reported that they have experienced difficulties with payment. Existing cases will be processed by the ticket operator within 24 hours. Semi-Final tickets are scheduled to go on sale today, Wednesday 15 February. Additional information about the next wave of ticket sales is expected ahead of the release. The Ukrainian broadcaster UA:PBC chose Concert.ua to handle the ticket sales for Eurovision 2017, but other ticket agencies have stated that the rules surrounding the procurement procedure was not open and fair. Right now UA:PBC is working with the European Broadcasting Union to resolve the issues with Concert.ua. The start date for the sales of tickets to Eurovision Song Contest 2017 remains uncertain, despite the previously announced information from the Executive producer of the Eurovision Song Contest 2017, Victoria Romanova. – The official start of ticket sale is postponed for about two weeks for some reason. – Tickets will soon be available. The same about the information about the price ranges. So it will be expected in February? – We don't have any exact date yet, but it will be in mid February. So it seems that everything about the ticket date is quite uncertain. – The price range is wide. All tickets will be distributed in a large number of categories. Therefore, we hope that Ukrainians from all over the country will be able to attend the competition. We will also await European fans, and fans from around the world. We'll release the prices at the same time we start ticket sales. – We'll release the prices at the same time we start ticket sales.